A Short Victorious War is the third book in David Weber’s Honor Harrington series published April 1994, by Baen Books. This story kicks off the confrontation eluded to in the first two books between Haven and Manticore. Haven needs a short victorious war to deflect their proles (unemployed masses) from panicking over frozen basic living stipend expenditures. Manticore makes the perfect victim it’s rich and it lies directly in Havens path to the Silesian Confederacy, their obvious next big target. But Manticore has been preparing for this for twenty years, maybe not always willingly or with grace but they have been building up their navy since before their current Queen took the throne. And they aren’t going to just roll over and give up when raiders are at their shores. TLDR: Honor delivers well-deserved smackdown left and right. Another free book link at the bottom of this post! The Honor of the Queen is the second book in David Weber’s Honor Harrington series and was originally published June 01, 1993. It takes place three years after the events that took place in On Basilisk Station which I reviewed last week on the blog. One of the many books I’ve finished reading in the past few months is Blood Rites by Jim Butcher, published July 2010 by Roc Paperback. This is the 6th in the Harry Dresden series and I am both happy and a little relieved to have made it to this one. I love the premise of this series. These books are told as a noir detective story complete with first person narration and Neanderthal views on women and an overall feel of a little darkness, a little grime, a loaded revolver, a shot of whiskey and the dame. Add to that the kind of dad-joke banter that Richard Castle would be proud of and you have a pretty good formula no matter what setting you’re in. The Dresden books combine crime lords and gangs of Chicago with vampires and wizards and tiny fairies who like pizza. It delivers what the urban Fantasy genre needs the most, uniqueness. Do the books have their weak points? Sure and I’ll touch and some of them below but overall, if you, like me, are enchanted by the idea of a modern world setting with supernatural elements and disappointed again and again at most of the stories crafted in a genre with so much potential, then you should definitely read Butcher’s series. In fact, I’d almost have to insist upon it. 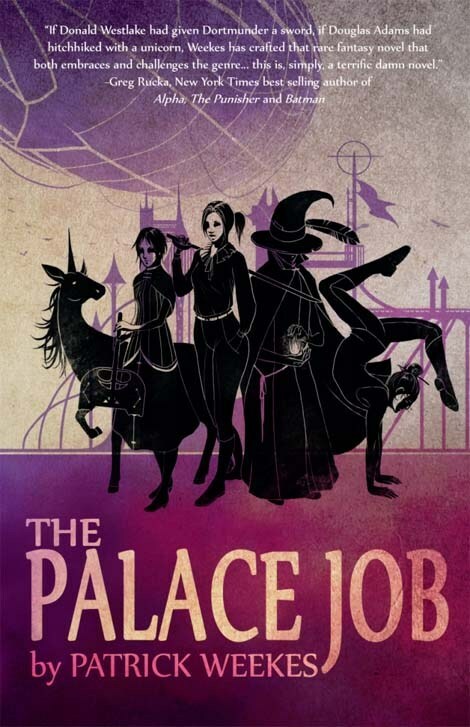 The Palace Job by Patrick Weekes. Published 2012 by Tyche Books. Cover by Lili Ibrahim. About the book and the author. Paul Antony Jones has added author to his list of titles which includes journalist, short-story writer and freelance copywriter. He lives in Nevada with his wife, four dogs and eight cats. In book two of the Extinction Point series, Emily Baxter, having survived the calamity that befell the world sets off on a journey North to find the owner of a voice on a radio, who promises her sanctuary and safety from the alien incursion in the cold of the Arctic. With her she has Thor, a malamute who apparently shares her immunity to the red rain and has taken up the duty of being her trusty protector. She soon stumbles upon another small family of survivors, however, in no small way thanks to the quirks of a micro-climate area. The threat from the aliens that started with the red rain has increased and expanded in chilling ways and is as mysterious as ever. Now with two children to protect as well, can she and Thor make it the hundreds of miles North to an unforgiving climate, through a deadened world where ever darkened shadow holds the threat of attack? Peter Grant is the son of a neat-freak, Sierra Leone mother and a junkie jazz-playing dad and he didn’t pass all his A levels. In fact, on paper he’s not much of a cop either. Not like his friend Lesley who’s on the fast track for DCI in homicide and has her copper instincts honed to a sharp point. But that’s ok. Unlike Lesley, Peter can see ghosts and he’s a nice guy. Or so he discovers one cold, wet evening on the job. This saves him from a clerk assignment and lands him instead in a secret branch of the Met with all of two officers – Peter included – that deals with magic and the supernatural. Written in Red, book One of The Other’s Series. Written by Anne Bishop. Published March 2013 by ROC Books. 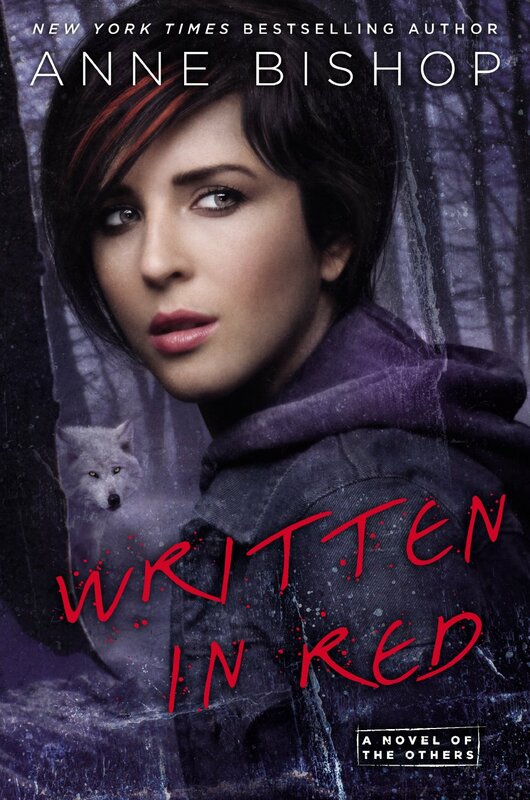 If you are only going to take a chance on one urban fantasy title this year, let Written in Red be the one. It has a unique take on the genre that charmed me to the core while maintaining threads of monstrosity, horror and the comically absurd. This is a fantastic and refreshingly original take on what being a werewolf might be like, on the little absurdities of everyday life and on what being human means. This is hands down my favourite Urban Fantasy tale of them all so far. It’s been too long since I picked up a new book from a (to me) fresh author and which just transported me right away. 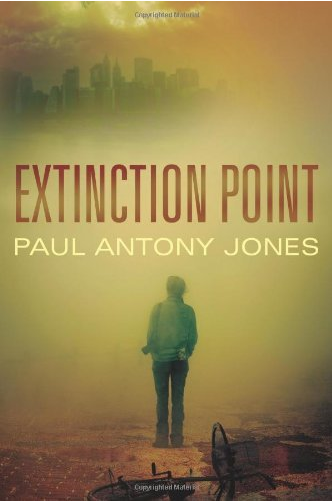 But that’s exactly what happened with Extinction Point by Paul Antony Jones (@PaulAntonyJones), the first in his ongoing series about Emily, a survivor from a planetwide apocalypse. (Published by 47North. Feb. 19, 2013).